I had high hopes for this one, since the concept – a woman fleeing through the desert, pursued by a lone zombie (“The woman in red fled across the desert, and the zombie followed”, if you will) sounded really promising. Oh, all the things they could have done with this setup! The woman, desperately walking through the desert, followed by an unrelenting pursuer who needs neither water nor rest. All the truly terrifying moments they could have gotten out of that! Instead, Colin Minihan and his co-author Stuart Ortiz took an entirely different direction, which only partly convinced me. The idea of the zombie being a therapist-substitute to whom Molly can voice her innermost thoughts to isn’t an entirely uninteresting one. As is the bonding that takes place through this process, on her side. However, once they suggest that the zombie shared similar feelings, the movie started to go downhill for me. Also, they ultimately went completely overboard, with her actually protecting “Smalls” from the soldiers, trying to drag him along et cetera. That simply was too much, and by that point, she didn’t seem “just” desperate, but rather really stupid to me. The movie isn’t helped by the fact that it simply doesn’t know when it would have been best to stop. I’d argue that her driving off would have been the perfect way to end the movie. Instead, we get an epilogue that a) felt very arbitrary and unnecessary and b) culminates into an open ending anyway. Seriously, if they wanted to keep things open, they just should have faded out 10 minutes earlier. And overall, while parts of the movie were entertaining, I never felt any real tension. Yes, the scenes in the desert were well shot and quite impressive, I liked the basic setup, and Britanny Allen’s performance is top-notch. Overall, though, this unfortunately was a major disappointment. 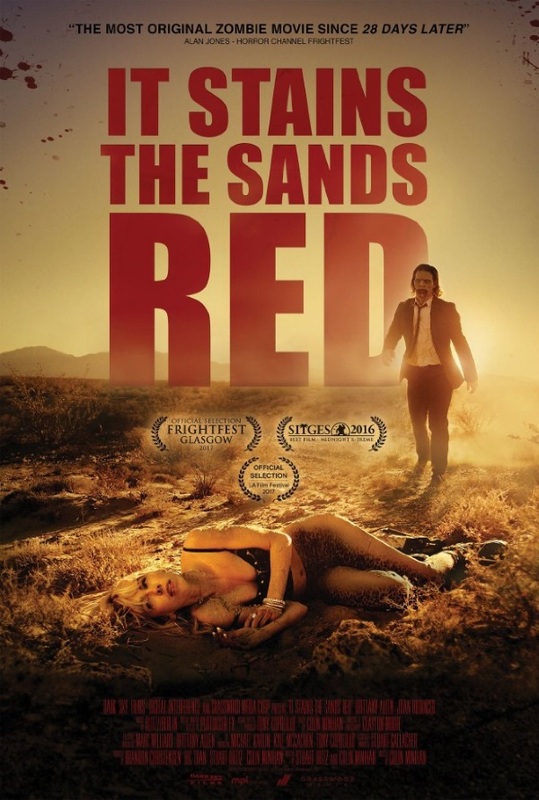 This entry was posted in /slash, cinema 2017, movie reviews, new releases and tagged /slash, /slash 2017, 2017, Brittany Allen, Colin Minihan, It stains the sands red, USA. Bookmark the permalink.